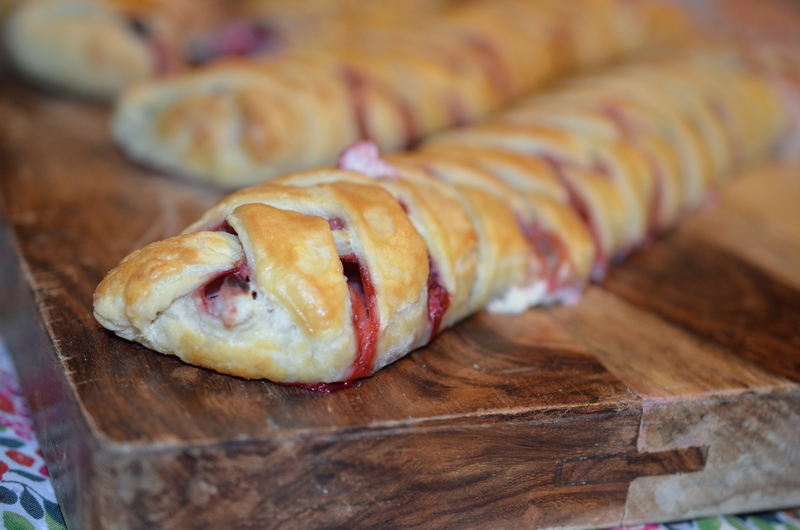 How could there not be pastries at a brunch, desserts are a must, right? Best for last? California Walnuts sent all the participants of #BrunchWeek a bag of fresh from the tree walnuts and I was thrilled to use them for a scrumptious sweet #BrunchWeek finale! Strawberries are the perfume of the produce section right now in our Florida groceries. I love this time of year with all the U-Pick farms, the road side stands filled with just picked berries. With the inspiration from the berries and the beautiful earthiness of the fresh walnuts I thought making a pastry would be perfect. To emphasize seasonal I wanted to use a floral essence, so I added the lavender. Perfectly seasonal! In a small sauce pan but sugar, water and lavender in and bring to a rapid simmer for about one minute reducing to about half. Remove from heat and allow to cool to room temperature. Add the softened cheese to a bowl and beat until combined. Add in remaining ingredients and whip until the mixture is light and fluffy, and completely mixed. Place in piping bag if you like, but a spoon will work just as well. 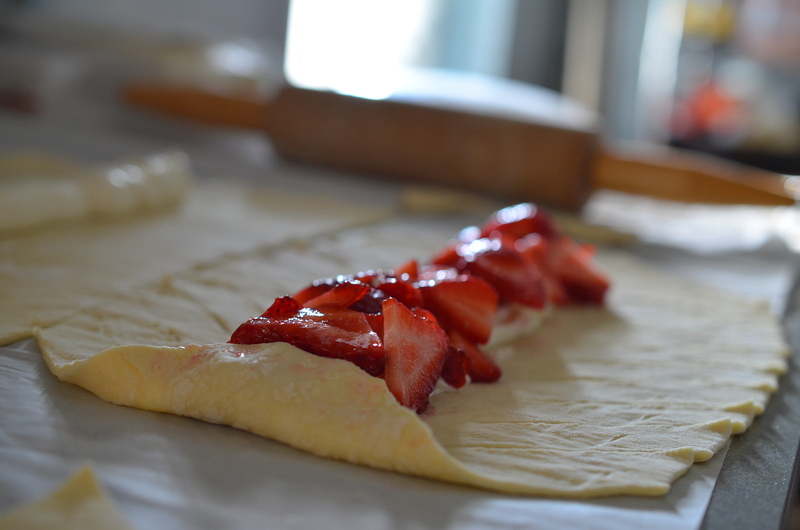 On a floured surface, roll one puff pastry sheet out to be 1/8 inch height to about a 12×10 square. Cut with a knife down the center so there are now two 6×10 sections. Trim a triangle from the corners of each section. 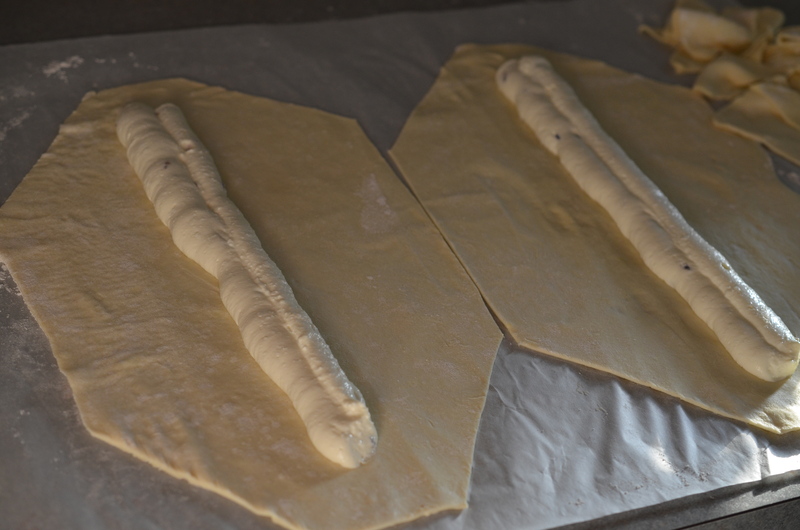 Cut angled strips down the 10 inch length of the dough, about ½ inch apart, make the same number of cuts on each side. 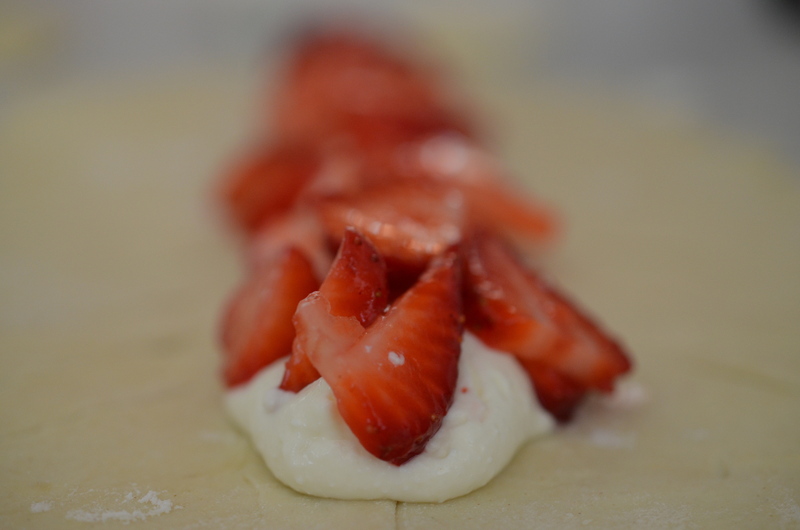 Pipe or spread a ¼ of the pastry cream down the center of the each piece. 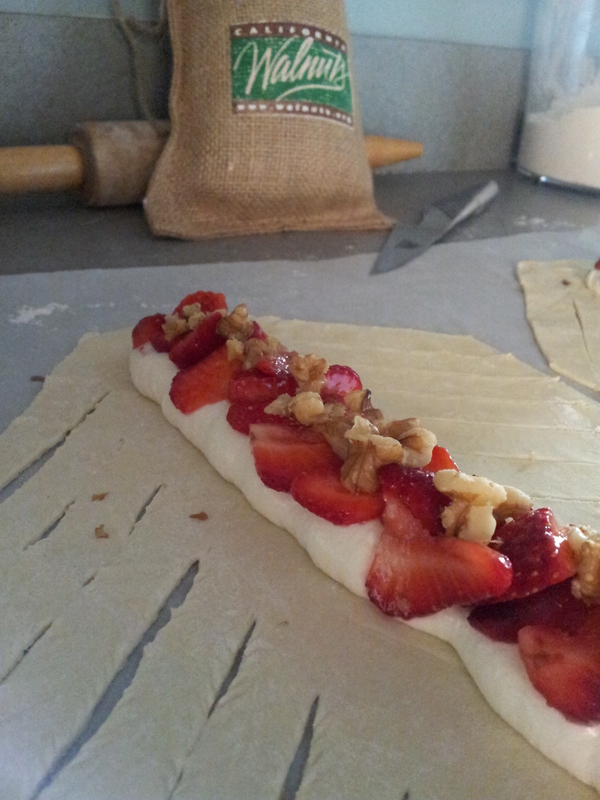 Top with 4 ounces of cut and cleaned strawberries and then sprinkle ¼ cup of walnuts down the center. 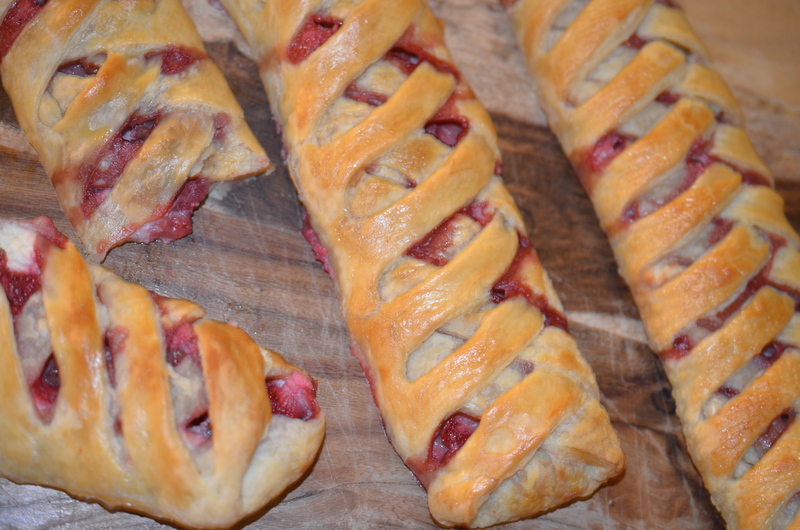 Make a fold with the top piece of the pastry over the berries. 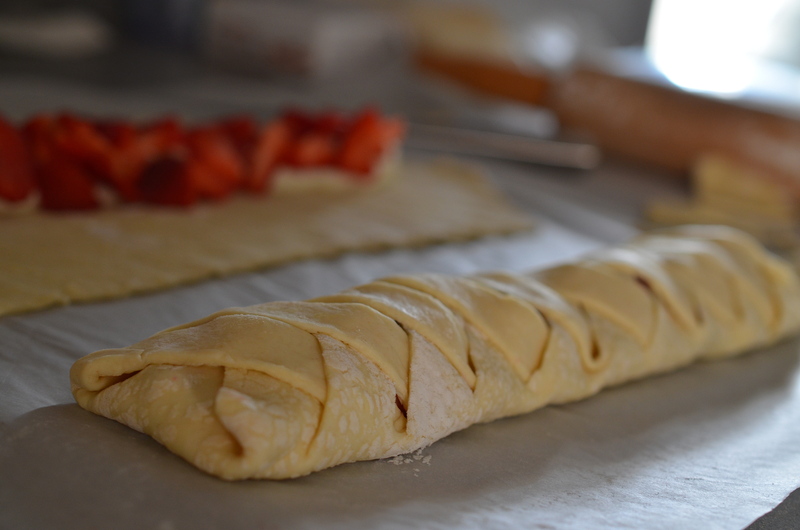 Starting at one end, fold the pastry strips over the filling, alternating sides, to cover the filling. Place on a baking sheet with parchment paper and brush with egg wash.
Repeat with remaining cut section of pastry, and then repeat with the second sheet of pastry dough. 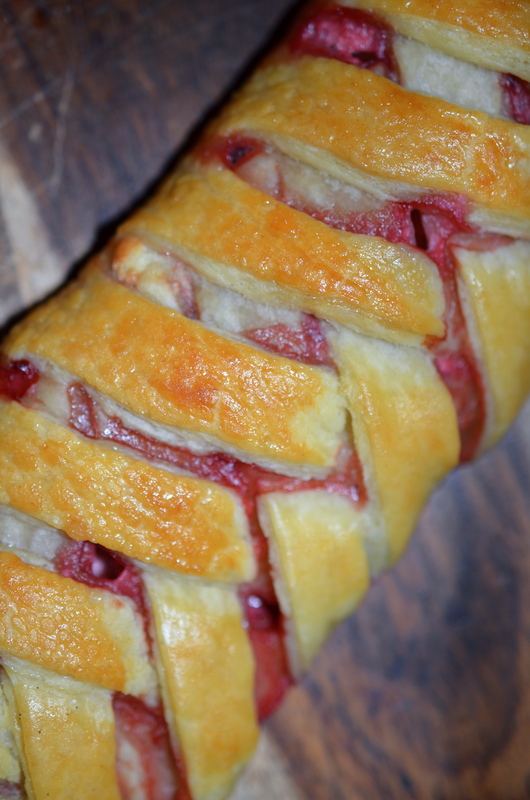 Place two braided pastries on each baking sheets. Bake at 400 for 20 minutes or until pastries are golden brown. Allow to cool on a wire rack for about 10 minutes. Cut each piece in half or in quarters depending how much your stomach is growling. Makes 8 large or 16 regular size pastries. These pastries could be a little sweeter for some, but a simple sanding sugar after brushing them with the egg wash would do the trick. The lavender is very delicate, not overpowering at all- infact, one may not even notice. The California Walnuts earthiness were the perfect complement to the light floral, the farmers cheese and to the sweet strawberries. As #BrunchWeek comes to a close today, leaving us with a library of ways to treat the Mom’s of the world tomorrow- I wanted to shout out again to all the participants of #BrunchWeek, and especially Terri of Love and Confections, and Christine of Cook The Story who made it all happen- You ladies are Fabulicious! 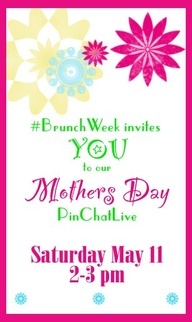 Join us at the #PinChat today, May 11th from 2-3 Eastern, for a chance to win prizes and participate in #BrunchWeek closing ceremonies!! Until then- take a look at all this mouth watering goodness! Maybe it’s just my experiences, but brunches often follow fun-filled, celebratory evenings, I assume that’s how Bloody Mary’s became so popular. Nothing like the hair of a dog! Thinking about brunch foods the last few weeks, made me consider my favorite hangover meals. It would be a smart assumption the “favorite” came to be in my college days. In Charleston, South Carolina there are endless possibilities of the cure all meal- during my days at C of C, my friends and I favorites were either Juanita Greenberg’s Burritos or Vickery’s Turkey and Brie Pita, maybe Andolini’s Pizza also.. The french fries made the Turkey Pita stand out as my preferred “not feeling so hot” meal and I still love to make it to Shem Creek every so often when I am in Charleston for a reconnection. The warm pita was coated by a layer of raspberry cream, a stack of sliced turkey and warm gooey brie. It’s a classic but still fabulous combination. 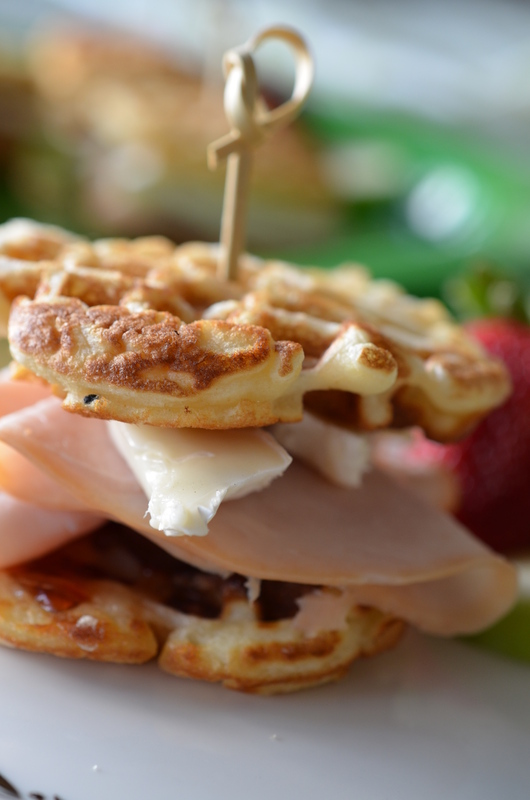 So when thinking about a #BrunchWeek inspired sandwich- what else- fruit, creamy, savory, and of course, perfect for any accidental hangovers that your guests that might stumble in with. 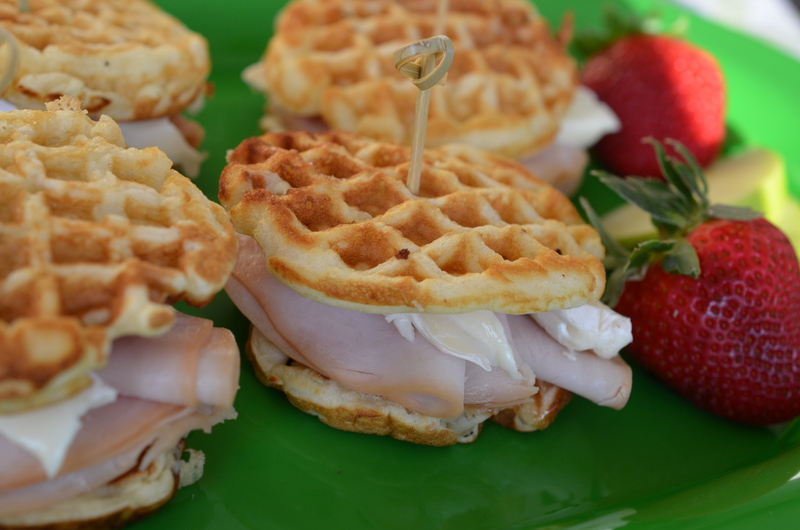 Figured I would twist the pita a bit and make it more “brunch-able”, with using waffles instead. I have a few different waffle makers/pans that I collected over the years, but my favorite is this pan. I love the small size and thinness of them, making them super versatile and fun to play with. With a mixer, beat the egg whites until they are stiff. In another large bowl, put remaining ingredients and whip until smooth. By hand, gently fold in beaten egg whites. Heat the waffle pan over medium heat on the stove. Drop about 2-3 tablespoons of batter into the wells, just filling them and spread with the back of the tablespoon. Cook until air bubbles come to the surface and break, about 1-2 minutes. With 2 ends of forks gently ease out the waffle pancake and flip onto the opposite side. Allow to cook another 1-2 minutes. 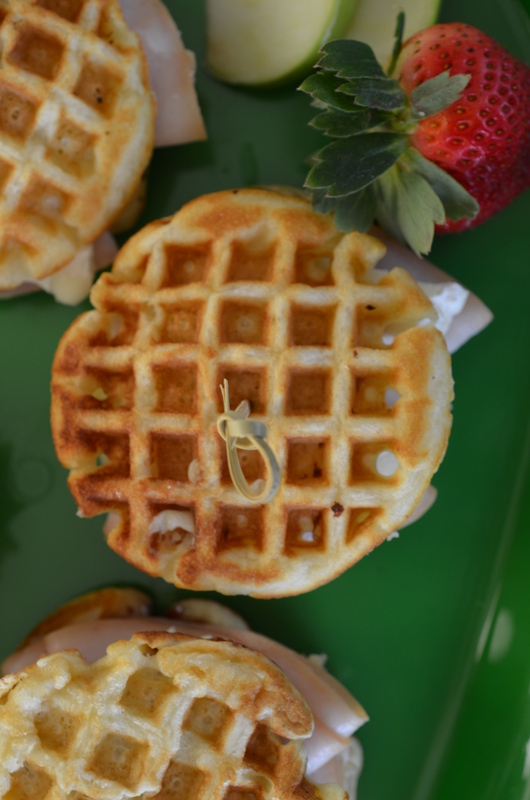 The waffle cakes can be made ahead of time and reheated in a 300 oven for 5 minutes. 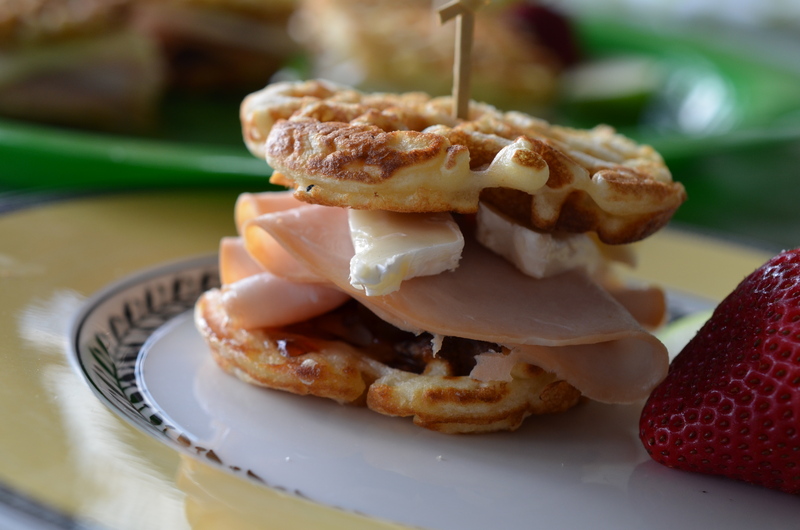 Assemble the sandwiches with a teaspoon of raspberry jam on both sides of the warm waffle cake, and layers of sliced turkey and brie. What a great week its been- I am so looking forward to trying out all the mouthwatering dishes I’ve seen during #BrunchWeek! Join the PinChat from 2-3, where even more prizes will be announced! 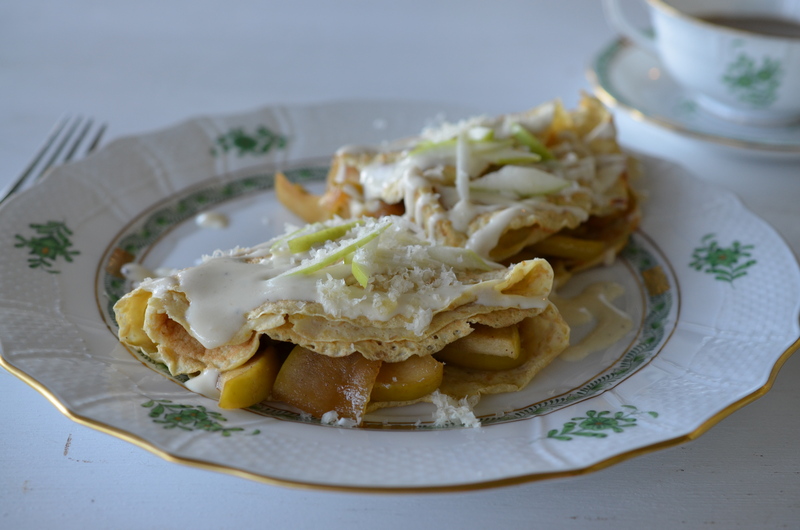 Here are a few more ideas for Mother’s Day Brunches! I am lucky that I am surrounded by such a large and diverse group of chefs’ every day. There is always someone finding something new, a cooking tool, a technical process, a cookbook, a just opened Asian market, a burger joint, a unique beer on the shelf. Creative ideas/food knowledge is a by-product of kitchen life; it’s a great way to take part of conceptual collaboration offering new ideas (ever heard of Pasta Teppanyaki). 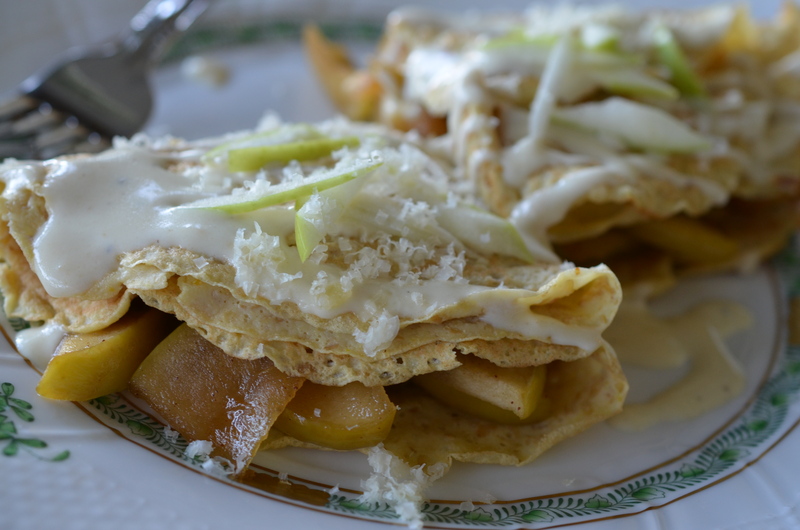 Enter the gluten free world- in particular crepes, perfect for brunch! There are a few girls I work with that are really into allergen and gluten free lifestyles. One has a family member that requires this special diet and the other just like to have a healthy balanced diet. The discussions with these ladies are often based on new discoveries in a gluten free diet. The Wheat Belly Cookbook came into their world and both were sold. I tried one of the microwave wraps from the cookbook and was convinced myself. 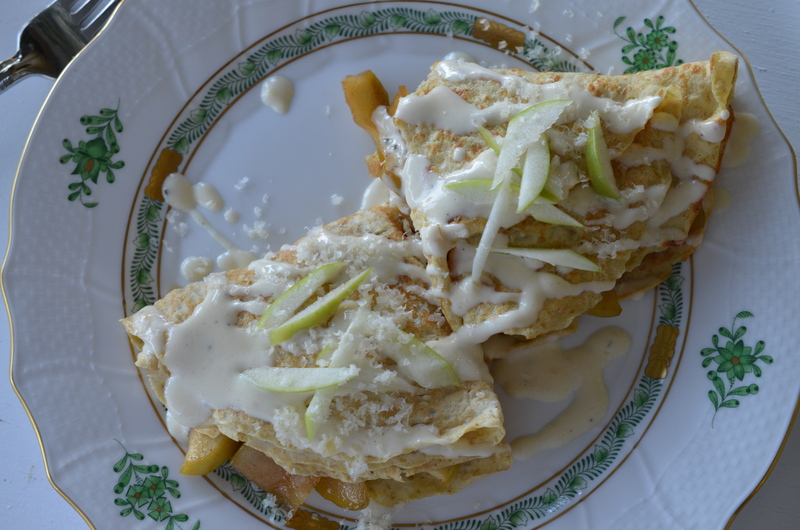 So looking for #BrunchWeek ideas that would bring diversity and inclusivity to all interests, I thought I would try the crepe recipe from their Wheat Belly Cookbook. Truth: I am a terrible crepe maker; and have ticked off many of chefs with my continued inability to make a crepe properly. However, I mask my lacking talent by making fun of anyone that wants to put crepes on a menu. Secrets out. Cut the washed apples into ¼ inch thick sliced wedges and cut again in half shortways, leaving about 1 inch bites. In sauce pan cook the apples, butter, sugar, and lemon juice over medium for about 15 minutes. Stir the butter and sugar around the apples to create a consistency of a pie filling. Set aside on low until ready to fill the crepes. This can be done ahead and reheated slowly to save time. Keeping it simple, start by adding the apple brandy into a small saucepot and bring to a simmer. Let the brandy reduce by half and add the heavy cream to the sauce pot. Continue to reduce the cream for an additional 10 minutes or until you reach half. Keep on low until close to serving; add in the shredded cheese, and stir until melted. Season with salt and pepper. By waiting to add the cheese until the end, it will prevent the sauce from breaking, when the fats separate, leaving a course, grainy, oily sauce. In a large bowl, combine the coconut flour, flaxseed meal and salt. In a small bowl, whisk together the milk, eggs and vanilla. Add the egg mixture to the flour mixture and stir until well combined. Coat a small nonstick skillet with oil and heat over medium heat. Measure 1/3 cup of the batter and pour into the pan, swirling the batter so it coats the bottom of the pan. Cook for 3 minutes, or until the top of the crepe appears dry. Turn the crepe and cook for 1 minute, or until the underside is dry. Repeat with the remaining batter, stacking the crepes as they are cooked. 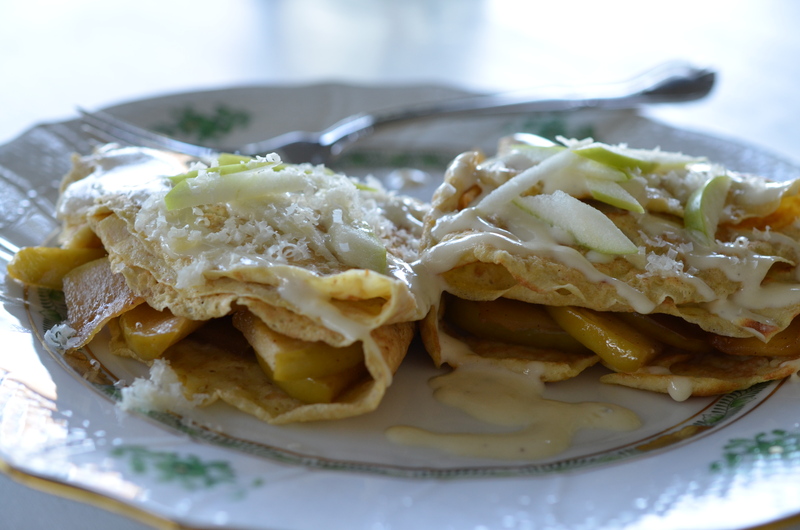 Top or fill each crepe with a spoonful of apples and drizzle with the cheddar cream. Let me add that it makes 8 servings if you are better then me at making crepes. I was happy with the 6 that cooperated for me, Sir Wes was happy with the 2 that did not. Eat your mistakes. 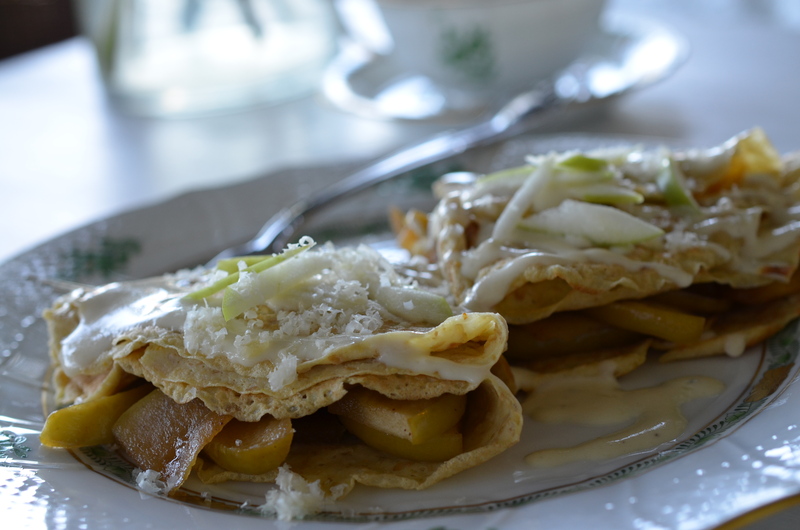 Another day of #BrunchWeek and another list of mouth watering dishes! For a chance to win one of the CrazyTown prizes just play in the a Rafflecopter giveaway! I know a lot of people that would swear up and down that a good party cannot be had without deviled eggs. Honestly, I have yet to meet one I haven’t liked. Hate to add it to a menu of mine as they are just so expected, and then the classic, down home southern girl inside of me tells me “what in God’s name am I talking about”, and they are saved from being 86’d from the buffet table. But nothing wrong with mixing it up, after all dip is equally important at all parties, brunch included! 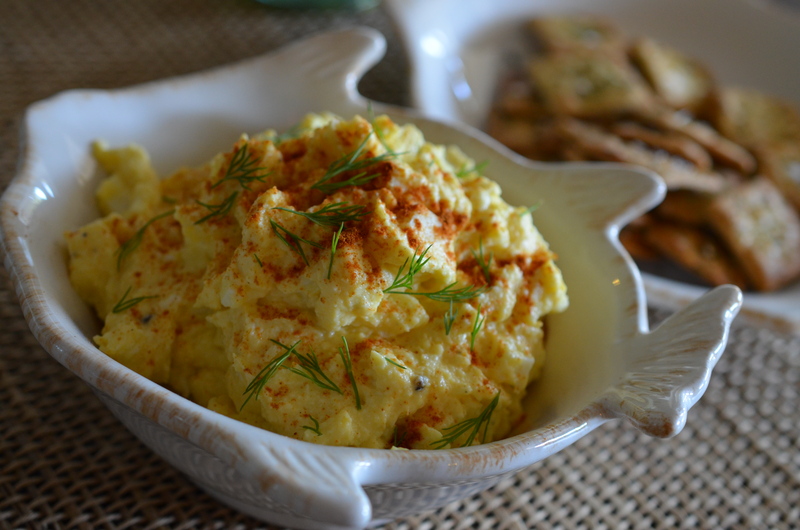 Some may say this is just egg salad, but it is served with crackers- so that obligates it to be a dip. Hands down, no question asked. The end. Dip. Place the eggs in a large saucepan and cover with cold water; make sure the water is a good inch above the eggs. Add in the vinegar and heat to a rapid boil. Place the lid on the saucepan and remove it from the heat. After allowing to stand for 15 minutes, drain the water from eggs and run cool water over them to cool. Add a few ice cubes to chill them faster. Peel the egg shells and slice them in half lengthwise. Rough chop half of the egg whites and place them into a large bowl. Put the remaining whites and all of the yolks to a food processor along with the mayo and mustard. Process until smooth. Scrape the mixture into a bowl and blend with the chopped egg whites. Season with salt and pepper. Can be made ahead and refrigerated overnight. To add a special touch to the Deviled Egg alternative I took out the standard pickle in the dip and added it to the cracker- which came out great! I love the zip and sourness in the crackers- definitely a unique twist on a standard butter crack. Watch your back Keebler! Using a food processor, add the flour and softened butter and pulse until combined. Add the oil and ranch seasoning and blend again. Add in the chopped dill pickle and mix until the dough forms into a ball. Remove the dough from the processor and shape into a disk, cover with plastic wrap and refrigerate for 30 minutes. Using a clean surface, a piece of parchment paper or a silpat sprinkled with flour, roll the dough to about 1/8 thickness. 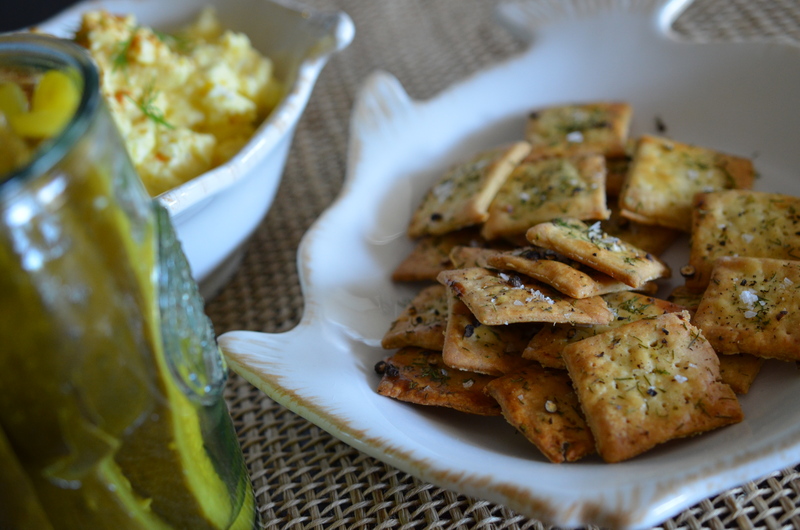 Using a cookie cutter, cut out the crackers and peel away the excess dough. 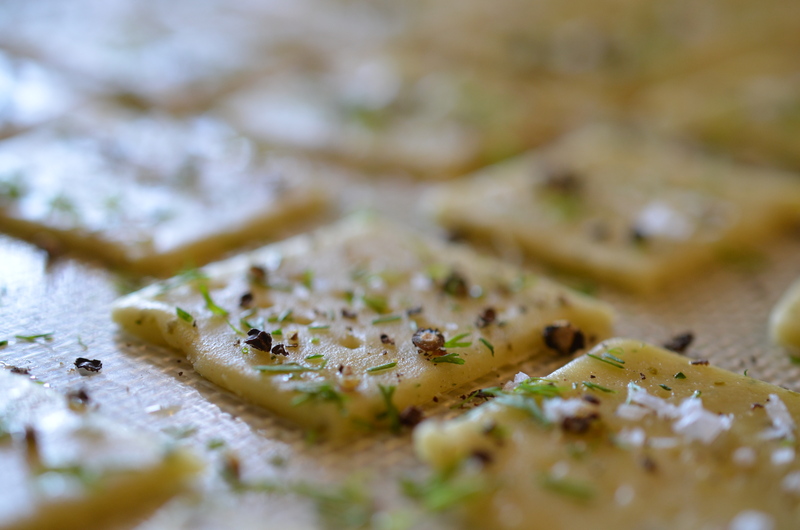 Place the cut crackers onto a parchment/silpat lined baking sheet and lightly brush the egg wash over the tops. Sprinkle with the salt, dill and pepper. 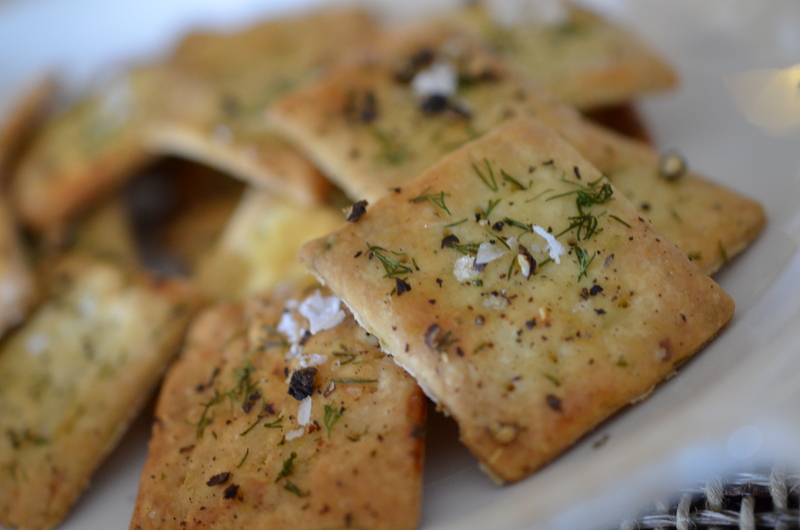 Prior to baking tap each cracker with a fork to allow are to escape and your crackers to remain flat. Bake in a 400-degree oven for 12 minutes or until golden brown. 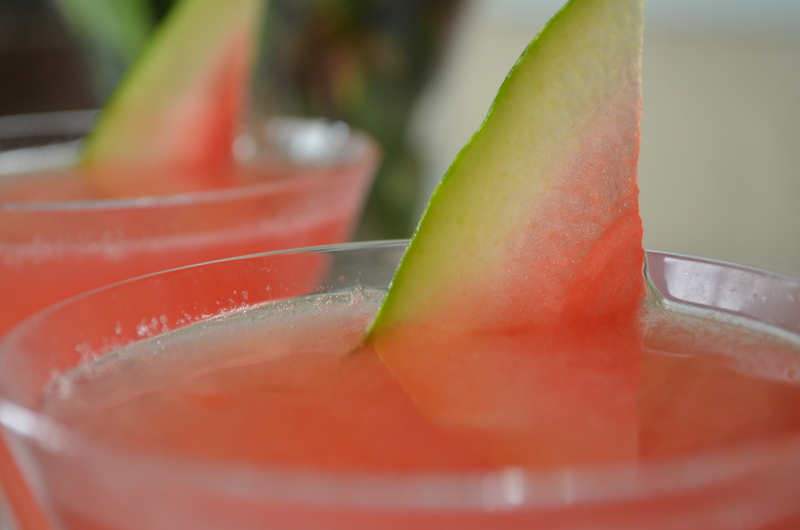 Allow to cool and enjoy! Makes about 50 crackers, depending on the size of your cutter. 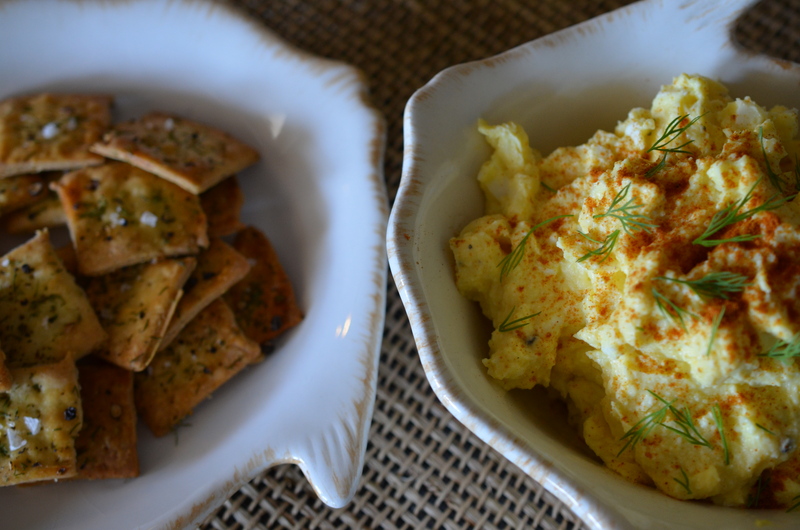 These Dill Pickled Crisps make a great vehicle for the deviled egg dip. Can’t get much more southern then this! Cheers to all parties, especially brunch! For a chance to win one of the amaze-ball prizes just play in the a Rafflecopter giveaway! Just look at this great list- all offer a chance to win! and plenty to get hungry over! I can’t wait to see whats going on at Girl in the Little Red Kitchen! 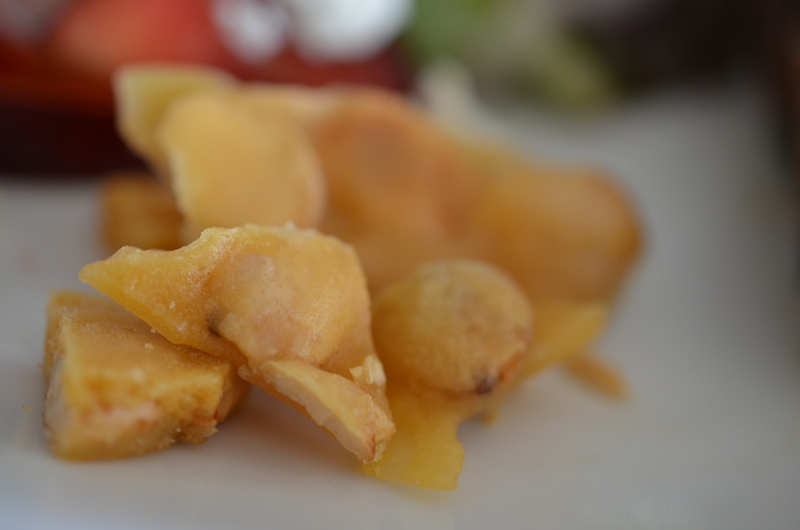 I adore Marcona almonds, known as the “Queen of Almonds,” which are imported from Spain. They are shorter, rounder, softer, and sweeter than the domestic variety. When I was in Barcelona they became a staple while walking the streets of the city. I picked up the best I’ve had at the market, Las Ramblas- and have been searching for their match ever since. I may just have to return to the scene of the crime to get them again- CC: Sir Wes. Last fall a tub landed in our offices at work, and slowly shrank into crumbs. These Queens inspired a conversation regarding unique cookies with myself and the pastry chef, whom thought using duck fat in lieu of butter would make an interesting brittle. I couldn’t agree more as I thought of the Spain/Catalan influence with the duck and Spanish almonds. In a small sauté pan melt the duck fat over medium heat. 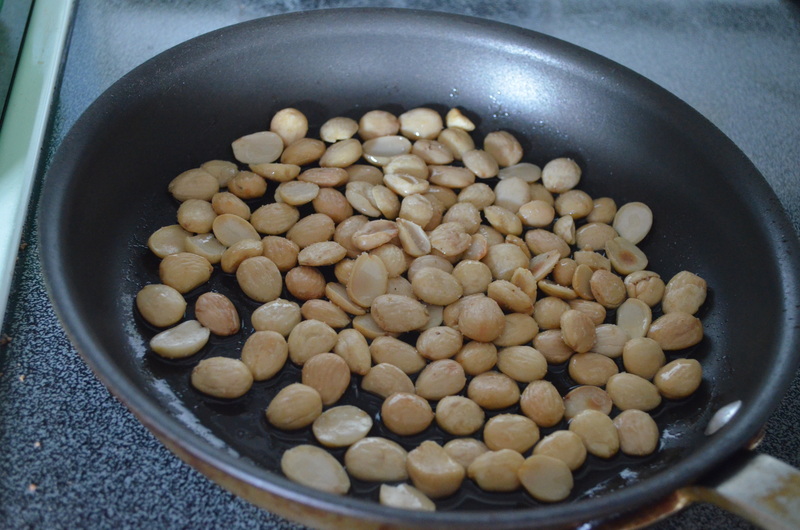 Add the almonds and stir constantly, toasting them for 2 minutes, Remove pan from heat. Remove saucepan from heat, and stir in almond mixture and baking soda. Immediately pour the mixture onto prepared baking sheet, spreading the brittle quickly into a ¼ inch layer with a metal spatula. Let set for 30 minutes or until hardened. Break into pieces. Makes about a pound of brittle. The brittle came out super light from the baking soda which makes it very easy to eat. Not at all the kind of brittle that breaks teeth. 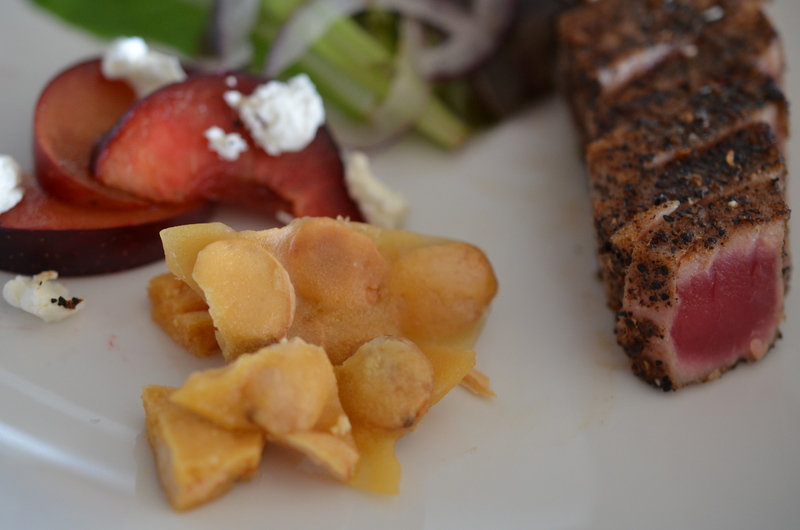 The flavor with the richness of the duck fat and sweet nuttiness of the Marcona almonds is balanced and perfectly decadent. This has been on my mind ever since our inspired collaboration and thought they would be make a great addition to a salad on a brunch. 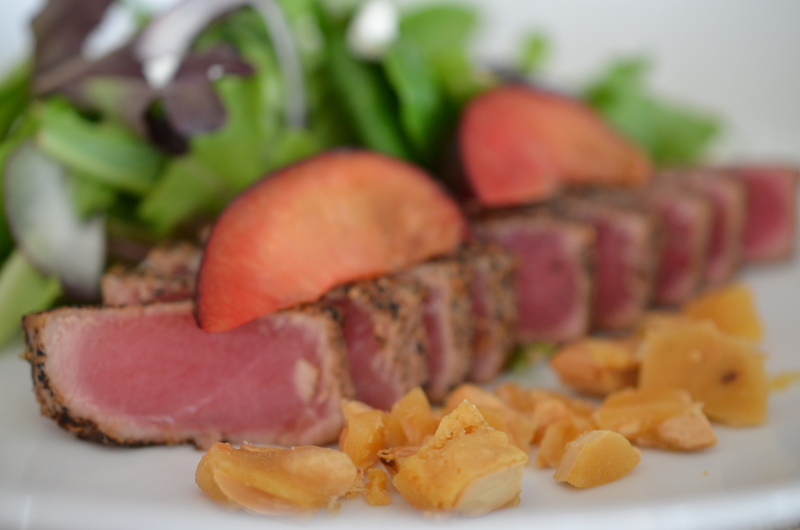 I added tuna, plums and goat cheese crumbles but would also be lovely with simple greens and raspberries. You can also serve the brittle alone in a nut or candy dish. While this brittle isn’t the same as the treasured bag of almonds from the Barcelona Market, it is quite inspired by them and the search for the Barcelonan Almonds led me to that cookie discussion with the pastry chef. Anyone ever been “biten” by the search for that perfect bite again? This list looks amazing- I can’t wait to see everyone’s posts!! To make the rosemary simple syrup place the water, sugar and rosemary in a small saucepan and simmer until the sugar is dissolved, about 5 minutes and cool. This can be made ahead, and nice to have on hand for those “moments of need”. 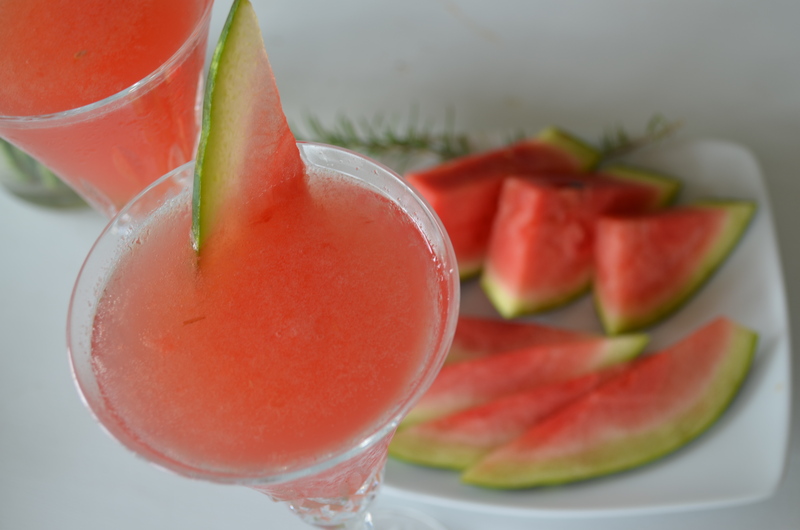 When ready to serve, drop the watermelon into a cocktail shaker, and crush with a muddler or wooden spoon. Add enough ice to fill the shaker, and then add gin, rosemary syrup and lemon juice; and shake. Strain into 2 champagne flutes. 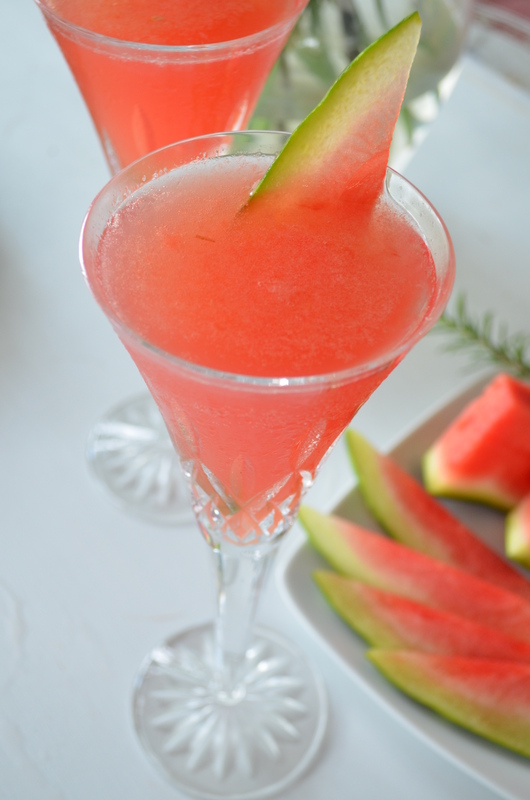 Top with champagne and garnish each with a watermelon wedge. Today there are a ton of brunchalicious posts from across the country- Check them out! Today is the start of #BrunchWeek, which leads straight up to Mother’s Day. There are bloggers across the country participating, so there is bound to be some great ideas for the coming Sunday’s feast. 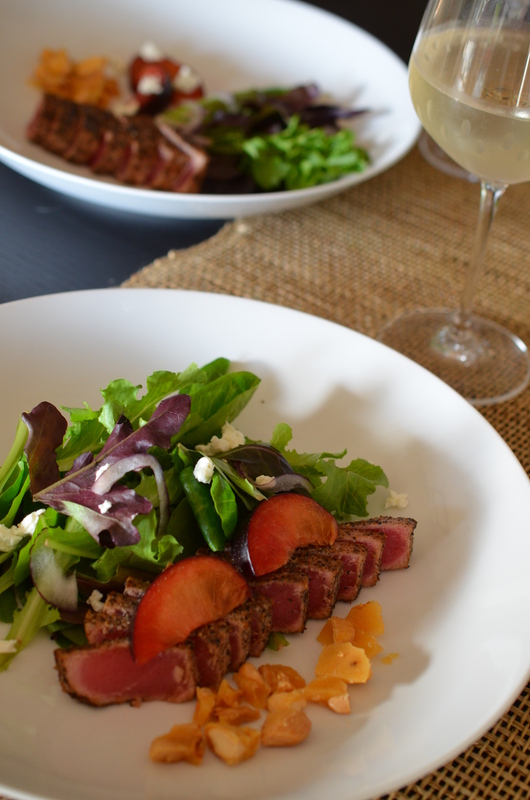 Check out the end of the post for a list of recipes and posts to be inspired by as well as list of incredible sponsors. Click on the Rafflecopter link to get a chance to win amazing prizes from the sponsors!!! Super easy! I have to admit- I’ve been gotten. 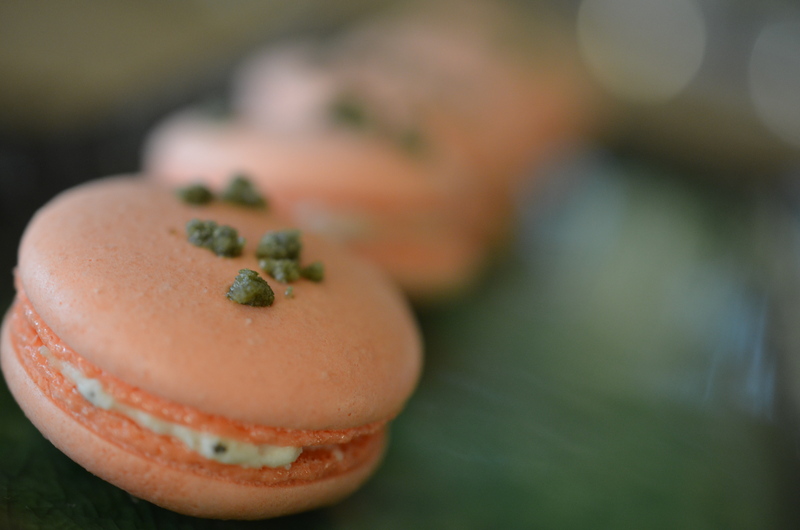 A little monster snuck into my head, and flipped a switch to make me believe that all the hype about macarons being “difficult” would not be true for me. I was convinced that I, an amateur, yet successful baker would not have any issues with this simple cookie. 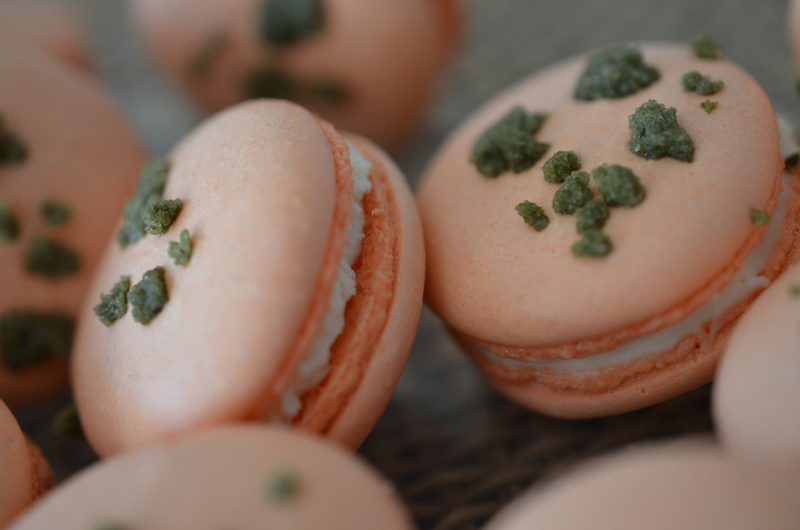 So when I was thinking about creative brunch ideas, savory macarons popped into my head and I signed on the dotted line- #BrunchWeek Day 1, Savory Macarons. Of course there was plenty of time to get started, just needed to get past that busy work week, and then Sir Wes’ birthday celebration #WEStival, my brother’s family visit, a catching up at work week, a weekend to relax, and then a crazy town week at work. Soon I was left with just two weeks to tackle these “simple” cookies. 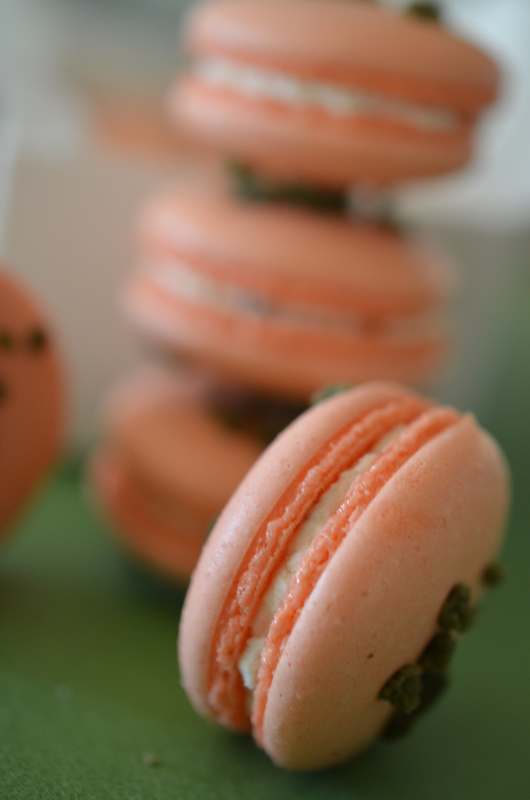 It turns out that the hype was real- macarons are as temperamental as they get, they are not simple at all, more like a monster in fact. Touch them wrong and its over for you. It was helpful having to try and retry baking macarons nightly due to deadline, as I am certain I have actually learned about the anatomy of the French monsters. 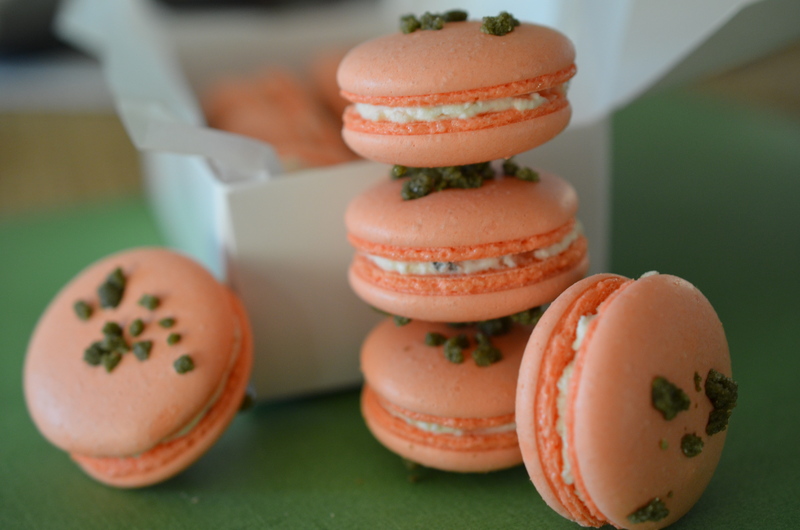 With the help of Les Petits Macarons written by Kathryn Gordon and Anne E. McBride, I spotted my troubles and made plans for the next batch. I strayed a few times over to good old Martha, but became sold on Kathryn and Anne’s methods and advice. My problems laid mostly with the feet, they had all types of problems- flat feet, no feet, wide-load feet, and most commonly, “why don’t I have model feet”. The monsters also had some intestinal problems, not much of a fan of this topic, but I’ll just say that there were runs and explosions. 1. Preheat the oven to 200ºF. Pulse almond flour, confectioners’ sugar salt and tomato powder in the bowl of a food processor 4 times for 4 seconds each time. Sift dry ingredients over a piece of parchment paper. 2. Hand whip the powdered egg whites and the granulated sugar in an electric mixer bowl, add in the egg whites and cream of tartar until the mixture is homogenous. Whisk on medium-high speed, when the egg whites reach soft peaks add the food coloring if you choose to use. Continue whipping until glossy stiff peaks form (about 8-11 minutes). The meringue should look like marshmallow fluff when ready or when you are able to hold the bowl upside-down without it falling out. 3. Sift the dry ingredients into the meringue and J-fold until you reach the, almost impossible to know, macaronner stage. It is important to fold the different components just enough,(sadly I think this only comes after you’ve learned what doesn’t work), but not too much or the macarons will crack. To make sure that you have reached the right point, once the ingredients appear combined, lift some of the mixture about 1 inch above the bowl with the spatula. If it retains a three dimensional shape, fold it again. When folded just enough, the mixture should fall right back into the bowl, with no stiffness, in one continuous drip. Fill your piping bag halfway, allowing the maximum piping control. 4. 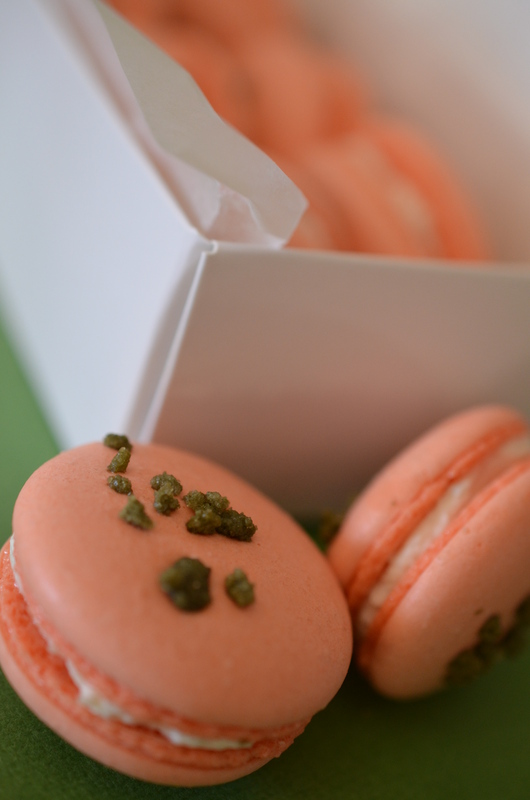 Pipe the macarons 1 ½ inches apart on silicon baking sheet lined sheetpan. (again, more of the practice makes perfect saying). Slam the baking sheet down to remove excess air (slam 6 times, from 6 inches above the table). 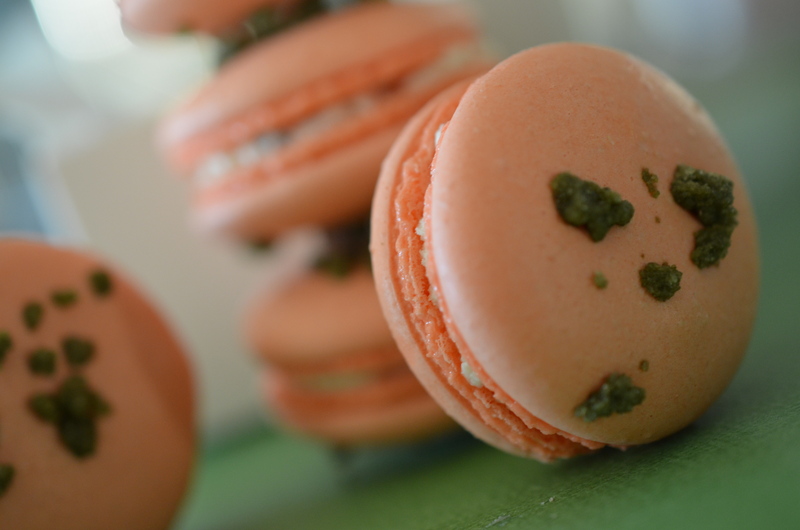 Sprinkle the crystalized basil on top of each macaron. Bake for 15 minutes and then turn the oven to 350 and cook for another 6-9 minutes depending on size. 5. 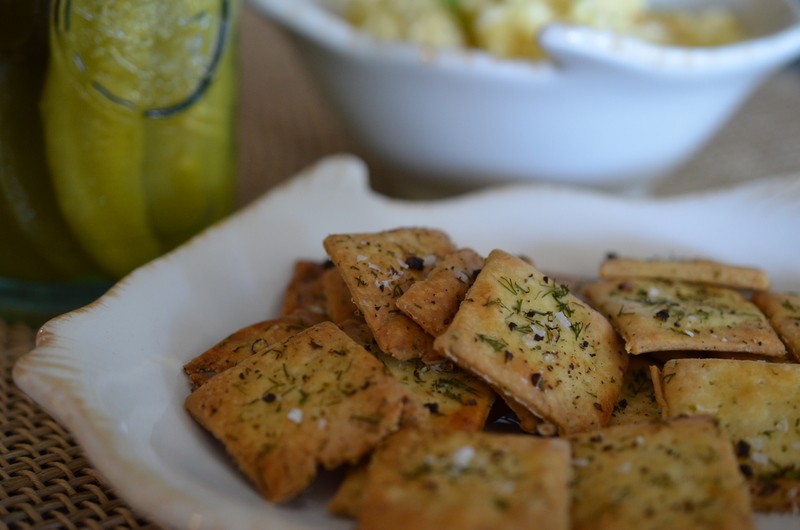 Fill with your preferred garlic herb spread, creamed brie, goat cheese, ect. Refrigerate until an hour prior to serving. ***With any failures there are learning’s. Pay attention to what didn’t work so you know what to try or avoid in the future. I have to admit, there is no way I am done with these monsters. I feel like they might have won this round, but now that I’ve cut my teeth, I am ready for round 2. I secretly love getting stumped in the kitchen, as it makes successes so much sweeter. 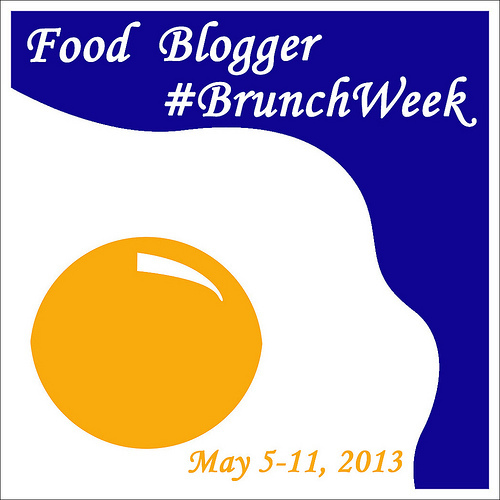 Take a look below to see this great list of #BrunchWeek Posts!! Click below on the link and see all the generous and incredible prizes the #BrunchWeek sponsors have donated!